I cannot believe it’s already July and the 4th is just around the corner! We’re planning a fairly laid back get-together, hosting a BBQ at our house with our best friends and then heading downtown to watch the fireworks together as a family. This dress arrived just in time for the holiday – I love that the colors are perfectly patriotic, but not in an obvious or too-literal way. (Oh, and did I mention that it’s less than $30?!) Since I’m the hostess this year & comfort is key, I’ll be keeping my look casual with a denim jacket, cork wedges & just a few bracelets. Love it with a capital L!! Have a happy 4th! I love your July 4th outfit! Gorgeous! The dress print is beautiful and cork wedges are adorable. This is an adorable dress and I love those wedges!! I love this dress! The muted colors are delightful, and the chevron print mixed with…geometric floral (? ), is so much fun!! What a cute dress! The print kind of looks like fireworks too! Such a gorgeous dress — you look fabulous! And I love that the look is festive without being over the top patriotic. Perfect. That red, white, and blue dress is patriotic and very cute! This is such a nice 4th of July outfit. Love how you paired it with a jean jacket. What a pretty dress. Love the print and the color is very summer. I also liked how you tied in the look with the denim jacket…it keeps it casual and chic…love it. i like the blue bag! 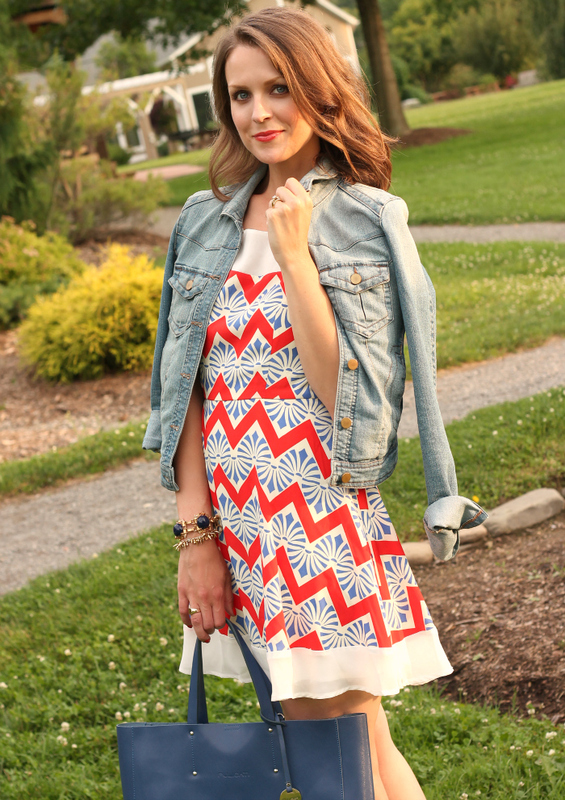 This is absolutely the perfect 4th of July dress…love it! That dress is seriously perfect for the holiday- or any summer day! Love the print, the colors, and the style! I want to say that I like that you are wearing sunglasses less in your posts lately. You have such pretty eyes it is nice to see your face more! Also that is the cutest 4th of July dress. That is so sweet of you to say! Sometimes sunglasses are necessary when my husband/photographer is standing in the direction of the sun (otherwise I'd be squinting in every photo!). But I will always try to keep a good mix of with/without. Thank you for taking the time to comment!! So fun and festive ~ love the pattern on the dress and the whole casual cute look! Im seriously in love with this dress!!! Its so pretty and that colors are so perfect. A denim jacket is my favorite thing to throw on! Adorable dress, perfect for the 4th! The prints of the dress is beautiful! 😀 I really like it! 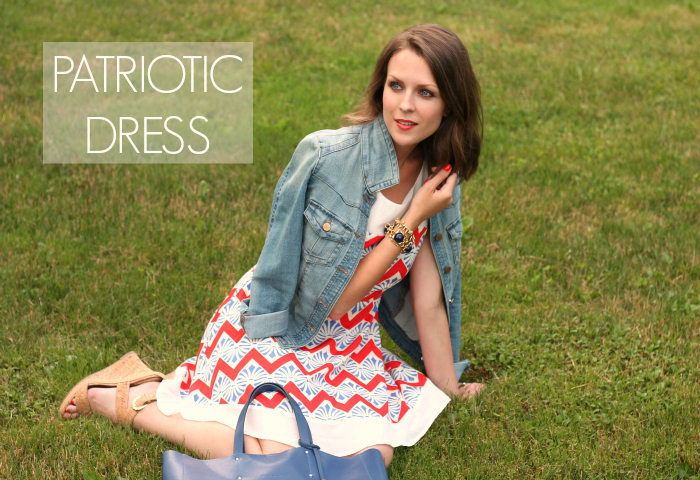 love this dress in a major way… what a fun, pattern-filled take on the 4th. pretty on you! That is the perfect patriotic dress! This dress is so cute! What a perfect dress for the 4th. Hope you guys have a great holiday. July 4th perfection!! Love this dress more now that I see it on you! Have a great holiday! Sounds like you guys are spending it the perfect way…friends, family & fireworks! LOVE it! Stunning on you! I LOVE that dress and might just have to order it so I have it in time for the 4th! Thanks for sharing! Love this dress Kim! So ladylike and pretty!! I love this patriotic dress Kim and your Tory Burch bag is just perfect… Happy Fourth! Gorgeous dress and at less than $30 this is definitely an amazing find. Love that dress paired with the jean jacket. So pretty! you look flawless. 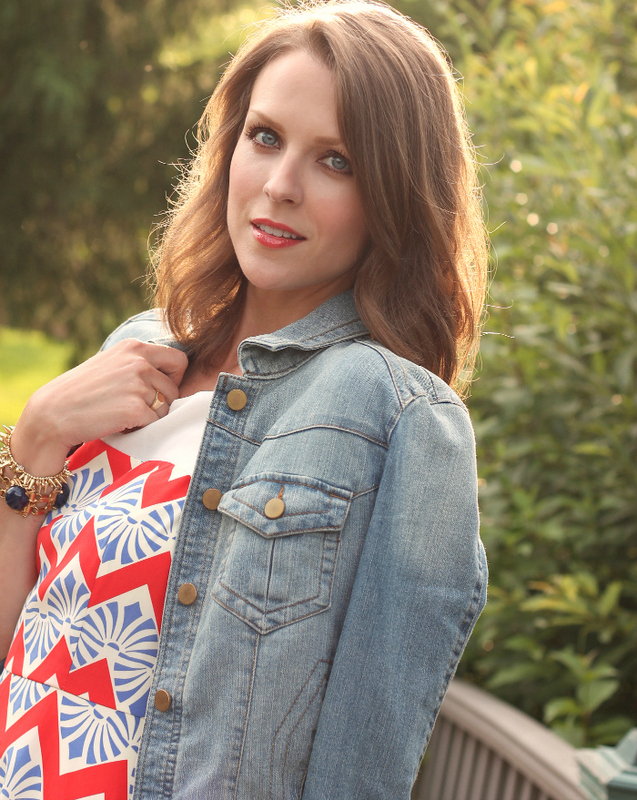 Love this all American look – just enough holiday flare! Such a pretty dress, and I love it with the denim jacket Kimberly! I would love for you to come linkup with me. Your dress is SO perfect for the 4th! It looks like fireworks print! Love it, you look gorgeous. Beautiful dress! I am going to have to hunt that down, I adore the print! The dress is perfectly subtle! It's very cute. I'd wear it all summer long. Wow this dress is so perfect for the upcoming holiday….yes low key but so chic!!! That dress was a steal, and the print is just gorgeous. Of course these are my favorite colors for summer, so I may just have to pick this dress up myself! This is a lovely outfit for the 4th! Have a wonderful holiday.